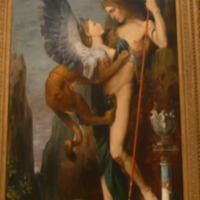 Moreau, a virtually unknown artist at the age of thirty-eight, triumphed at the Salon of 1864 with his interpretation of the myth of Oedipus and the Sphinx. This painting represents the moment when Oedipus confronts the winged monster outside Thebes and must solve her riddle to save his life as well as those of the besieged Thebans. The work shows Moreau's awareness of Ingres's version of the subject (Musée du Louvre, Paris), painted in 1808, which Moreau had sketched. It also demonstrates his familiarity with works by the early Renaissance painter Andrea Mantegna, whose paintings Moreau had studied at the Louvre. Moreau's choice of a mythological subject and his deliberately archaizing style distinguished his painting from the Realist and naturalist currents of the 1860s. This painting was a success at the Salon of 1864, where it won a medal and helped to establish Moreau's reputation. A painting of the same subject by Ingres of 1808 (Musée du Louvre, Paris) served as a point of departure for Moreau's own interpretation of the theme. Holten [see Ref. 1957] has argued that Moreau derived the posture of the sphinx from a poem by Heinrich Heine. Dorra [see Ref. 1973] believes that the pose of the sphinx is based on the etymological meaning of the word "sphinx"; a paper written on this subject was published in 1863 [see Ref. Bréal 1863]. Others have suggested that the pose of Oedipus and the Sphinx were informed by Moreau's knowledge of antiquities, knowledge he could have acquired at the Louvre or from books in his and his father's private library [see Refs. Helma-Tisserent 1981 and Moret 2000]. This picture has been interpreted as being not only about good versus evil, but about the conflict between the sexes [see Ref. Holten 1960]. Paladilhe [see Ref. 1971], in a Freudian reading of this painting, notes that at the time Moreau was painting this his father had died and he was projecting in this canvas his unconscious desire to exorcise the castrating influence of his mother. It has also been suggested that this work symbolizes Moreau's own struggle in choosing the life of an artist and having to give up sensual gratification [see Ref. Kaplan 1974]. More than thirty studies and many repetitions of this work were made. Julius Kaplan, in "Gustave Moreau," Los Angeles, 1974, reproduces the following: a pencil study for Oedipus and a copy after Ingres's Oedipus (in "De Cavalleriis, Antiquarium Statuarum Urbis Romae") of about 1860 (no. 30); a watercolor of Oedipus and the Sphinx of about 1860 (no. 31); a first idea for Oedipus and the Sphinx, in pencil, pen, and ink, of 1861 (no. 29); an undated study for Oedipus, in pencil (no. 32); and an undated study for the Sphinx's wing, in pencil (no. 33). Gustave Moreau (French, Paris 1826–1898 Paris), “Oedipus and the Sphinx,” Mapping Mythology: A Digital Collection of Classical Mythology in Post-Antique Art, accessed April 22, 2019, http://www.mappingmythology.com/items/show/89.